I knew I had some leftover stuffing sauce from last night’s stuffed aubergine. I thought that might make an interesting filling for omelets. When I opened the fridge, I discovered less sauce than I had remembered and only three eggs. What to do? I stretched the sauce with a few grape tomatoes and stepped it up with another teaspoon of harissa. Harissa might be come addictive. I put a splash of milk in my copper bowl, broke in the eggs and whipped them together. I melted some butter in my special omelets only pan, added the egg mixture and let it set. I then flipped it over and spread the sauce over it, sprinkled on some grated parmesan cheese and popped in the oven for a few minutes to melt the cheese. The result? a thin fritata with and interesting sweet/savory toping. A side of 15 grain toast and it was breakfast! Lots of Flavor, Lots of Work. Sometimes you see a picture and a recipe and you just have to make it. Simon Rimmer’s Spice Filled Aubergines is one of them. Spice filled aubergines just out of the oven. Start with two thick slices of aubergine (eggplant) – mine were roughly two inches high both from one eggplant. Cut a circle around at least 1/4 inch from the inside of the peel about a half inch deep. Score it inside the circle. Salt the eggplant top and bottom and drain in a colander for 30 minutes. Cover 1 tablespoon of dried currants with boiling water and set aside. While the eggplant drains, chop a small onion and two cloves of garlic while you wait on the eggplant and currants. 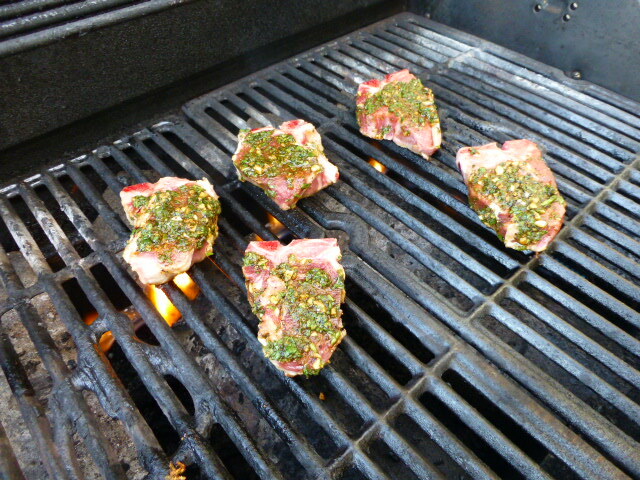 Also, finely chop about 1/4 Cup flat leaf parsley. Cut thick slices from center of two tomatoes and set aside. Chop the rest of the tomato. Note to self – next time take calipers to measure eggplant and tomato diameter so they are the same size. After 30 minutes, rinse and dry the eggplant. Fry both ends of the eggplant in olive oil about two minutes per end. Place eggplant in an oven safe baking dish. Bake in a 390 oven (temp was converted from C to F) for 30 minutes until the eggplant is soft. Sauté onion and garlic in oil until soft. Add the currants in their soaking water, the chopped tomato, a heaping teaspoon harissa (Moroccan spice paste), a half teaspoon of cumin, a dash of coriander and a pinch of cayenne pepper, lower temperature and let simmer while the eggplant bakes. The sauce should reduce as it cooks. You don’t want it too wet when it is done. Remove eggplant from the oven. Let eggplant and the stuffing sauce cool enough to handle. Punch down the circle you cut in the top of the eggplant to near the bottom to form a cup within the slice. 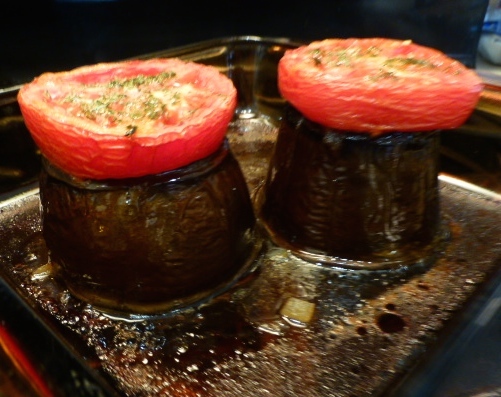 Stir parsley into the stuffing sauce; fill the eggplant cups and top with a slice of tomato. Brush the tomato with olive oil, sprinkle with a little parsley and a little hint of cayenne pepper. Put a couple of tablespoons of water in the dish to keep the eggplant moist. Return to oven for abut 30 minutes until heated through and tomato slices are baked. Serve with Greek yogurt. Spice filled aubergine on Greek yogurt. 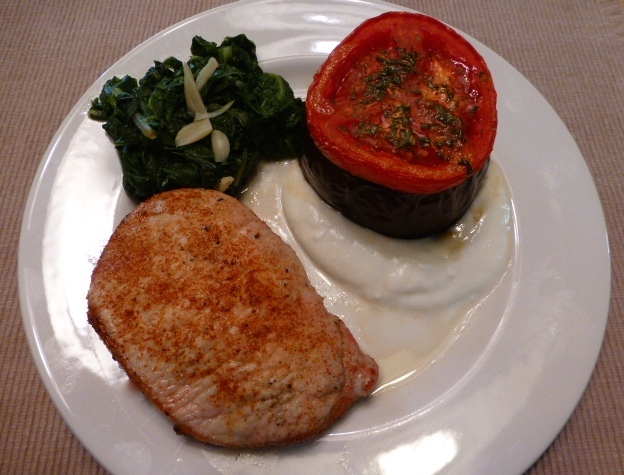 A cayenne pepper dusted grilled pork loin chop and green chard with garlic chips complete the meal. I plated the aubergine with a grilled cayenne pepper pork loin chop and steamed green chard with garlic chips tossed with a splash of red wine vinegar. The stuffed aubergine was a flavor treat. Last night, I thought it was too much work to make. This morning, remembering the flavors stuffing sauce makes me think It might happen again someday. It was very, very good. Perhaps it was worth the labor. 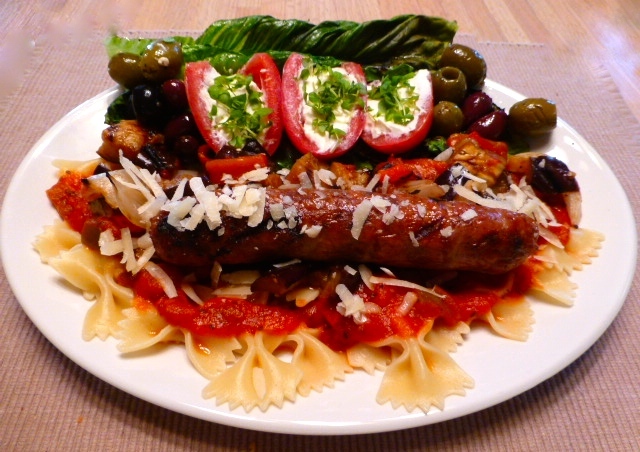 And maybe next time with lamb or a spicy link sausage… and garlic bread… hmmmmmmmmmm? Many top chefs in kinder climates forage year ’round for fresh ingredients for their recipes. Wild mushrooms, fennel pollen, lambs quarter, purslane and other delicacies make dining in their establishments an adventure. Not to be outdone, I had to try my hand at foraging. Lacking a moist and plant-rich environment, my efforts were not as productive as those of folks on the California coast or northeast woodlands. 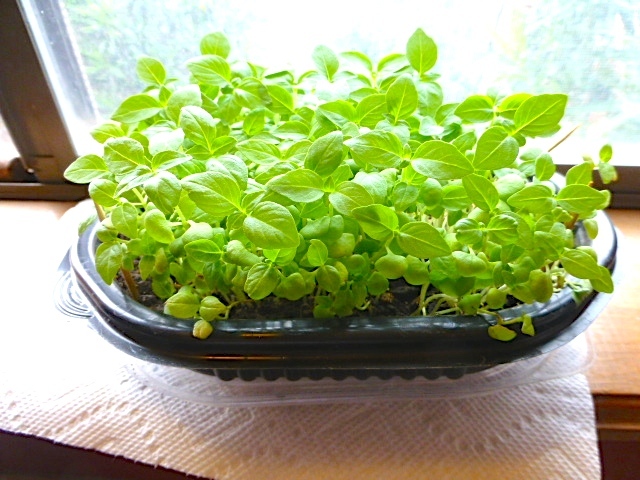 I was successful foraging at our new Sprouts market! 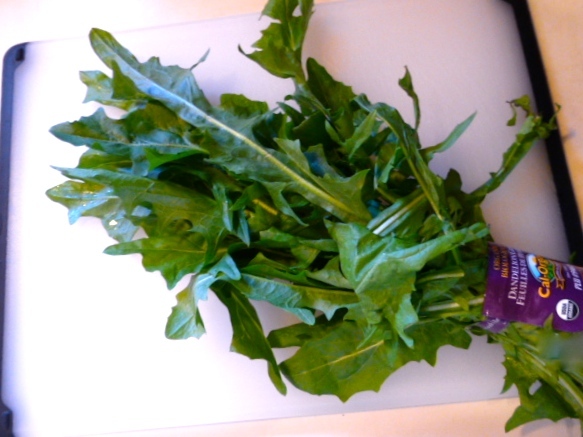 I scored fresh French dandelion greens. My daughters, Mande and Emily, were always shocked when I’d pick dandelion greens from the yard in spring and serve them in salads. They swore I was trying to poison them. Now that I have a grass-free landscape, picking dandelion greens is a little more challenging. I’m always grateful when French dandelions appear in the market in the spring. Fresh French dandelions are always a spring treat. Having the dandelions inspired a Dinner at the Doublewide supper. I diced a couple of strips of bacon and fried it up crisp. While the bacon drained on paper towels, I sautéed a little chopped onion in the pan drippings. When the onions were tender, I took the pan off the heat, returned the bacon to the pan and added a generous splash of apple cider vinegar to the pan. I mixed it all up and poured this hot dressing on torn dandelion greens and tossed it together to wilt the greens a bit. 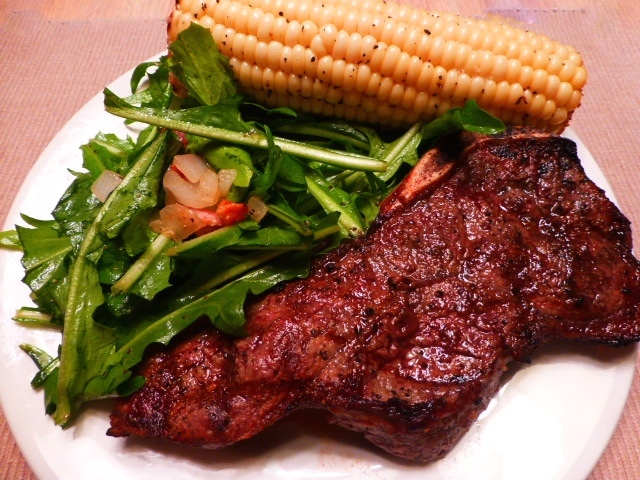 The greens were served with roasted corn on the cob and a small loin steak to make a down-home meal with wonderful contrasts in texture and flavor. 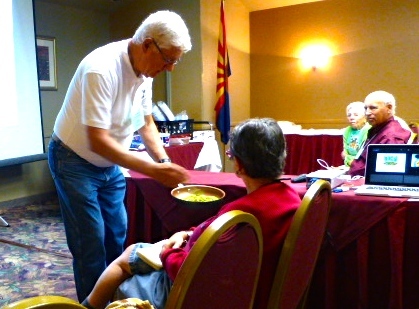 I was invited to the Sonoran X Conference last weekend to do two cactus cooking workshops. 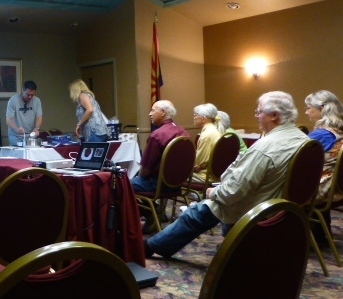 It was my second invitation to do demos at a Sonoran Conference. I am honored that they liked my work enough for an encore! I had a suite with a kitchenette – an electric two-burner cooktop, a microwave, a refrigerator and a sink. I brought my induction burner with me and used it for most of my prep. I’m getting smarter with experience. I now have a collapsable cart to transport the stuff it takes to do a demo. It is a great help. I prepared my “Three Sisters Meet the Guys from Down the Block” recipe, my raw nopalitos, jicama and orange section salad, and mesquite waffle stix with yogurt and prickly pear syrup. The three recipes were well received and some folks took second helpings which is always a good sign. You can find the recipes in other posts here on the blog. Adding nopalitos to the sauté pan to illustrate how I cook them. Showing the audience how sautéing reduces the sticky sap of the nopalitos and changes their color from bright green to army fatigue green. Charlie and Donna, my nephew and niece, plated and served on Saturday. Jack did the job on Sunday. It always good to have great help!!! 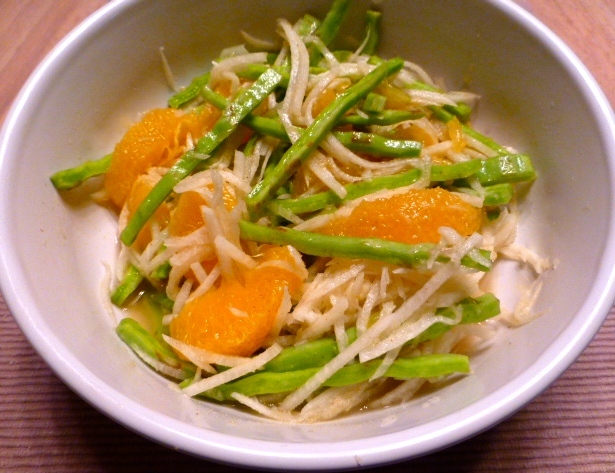 Julienned raw nopales, jicama and orange slices in an orange vinaigrette was a hit with the audience. 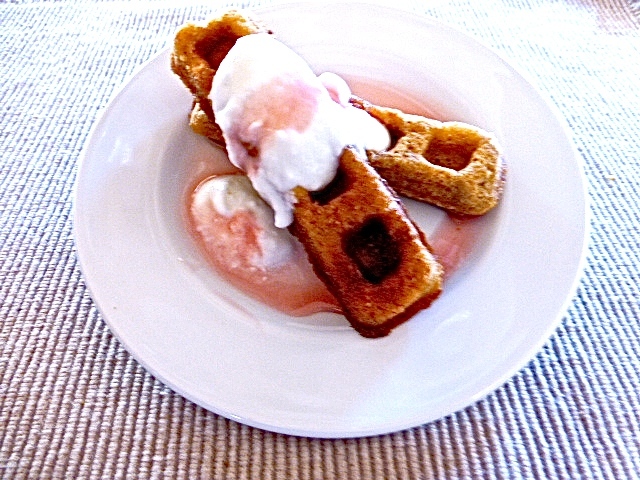 Mesquite waffles, yogurt and prickly pear syrup were a treat for the tasting experience. Look out, Tucson, The Gringo Gourmet is on the Way! I am very excited and pleased to have been invited to conduct two workshops at the Tucson Cactus and Succulent Society’s Sonoran X Conference April 19 and 20. I’ll be discussing prickly pear as food and medicine and preparing a couple of recipes for tasting. 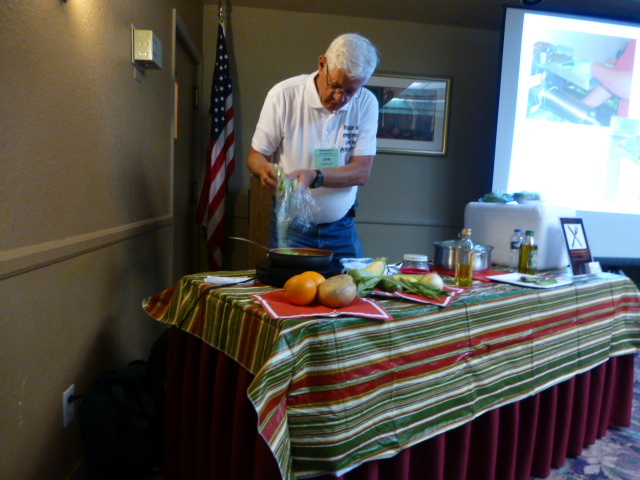 Of course many of my recipes are non-traditional so I call my workshops “Not Your Mama’s Nopalitos.” I also did workshops at the Sonoran IX conference two years ago, so I feel extra good about being invited back. 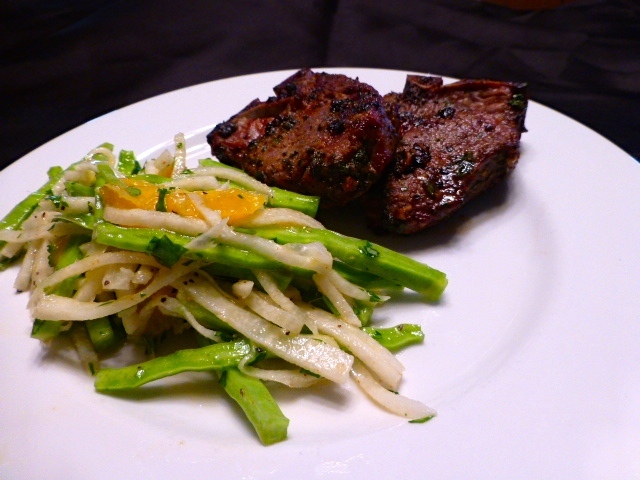 Here’s a preview of a new recipe for Nopalito, Jicama and Orange Slaw with an orange vinaigrette dressing. It is cool, crisp and delicious. Delicious is not just my opinion. Diners at the Gringo Gourmanderie think so too! Next week I’ll share photos from the Sonoran X Conference. Here’s a preview of the slaw. I’ll be adding one more surprise ingredient at the workshops. Sometimes, you walk through the store looking for inspiration for dinner. It can be difficult to get inspired when you really are not in the mood to cook. So, you wander by the deli and see a nice olive and feta salad! Well, why not? Then you go by the meat counter thinking about their really good krab (imitation crab) and green chile salad and find out they only had the Italian dressed version. Well, get some anyway, and then pick out a little pre-cooked shrimp. Go by the bakery and pick up a couple of whole wheat bollios because garlic bread sounds good. (And if you make the garlic bread with bollios, you don’t eat a whole loaf of French bread.) You get get home and prep the bread while the oven heats. 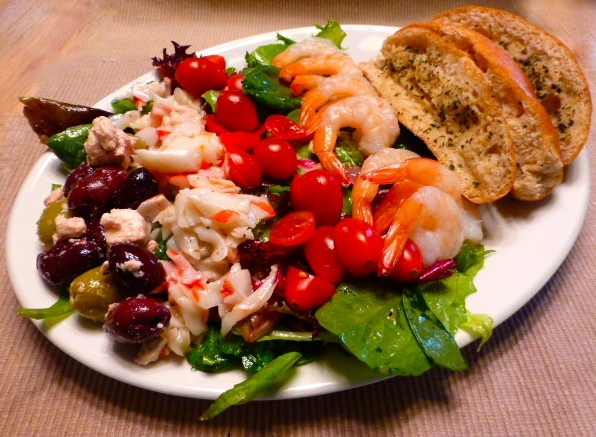 While the bread warms, you slice some grape tomatoes and toss some mixed salad greens with a little Italian dressing. Then you decide to plate it with the “goodies” in rows like a Cobb Salad. But you didn’t boil an egg and you didn’t use ham, so you look at your protein and decide it must be a Kobb with a K Salad because you used krab with a k as a major ingredient. Kobb with a K Salad with a side of herbed garlic bread makes a pretty good cool supper for the season’s first 90 degree day! 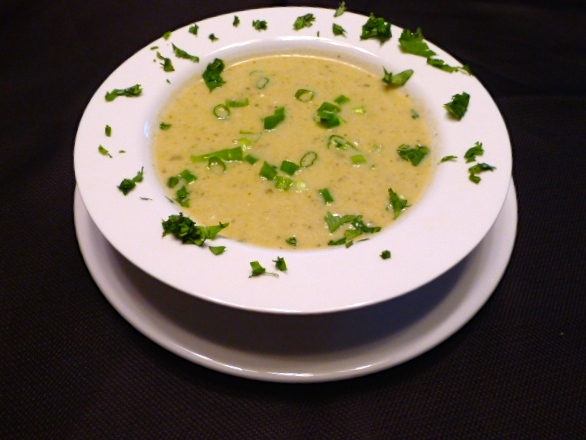 Who doesn’t love chile verde con carne (green chile with meat)? Traditionally cubes of pork are simmered in chicken broth with onion, garlic, diced green chiles and diced potato until the pork is done and tender and the potatoes are cooked. Sometimes it is served with rice and beans on a plate. Sometimes it is the filling for a burrito. It is a TexMex favorite. It is always fun to play with a classic and approach it differently. I made the green chile sauce by simmering the potatoes and aromatics in achicken stock. I trimmed a little fat of my pork chops and added it to the broth for another little layer of flavor. The fat strips were removed when the sauce was finished. When the potatoes were done, I mashed about half of them in the pot. Then I simmered and stirred until the mashed potatoes thickened the broth and the liquid was reduced to the consistency of a cream gravy. 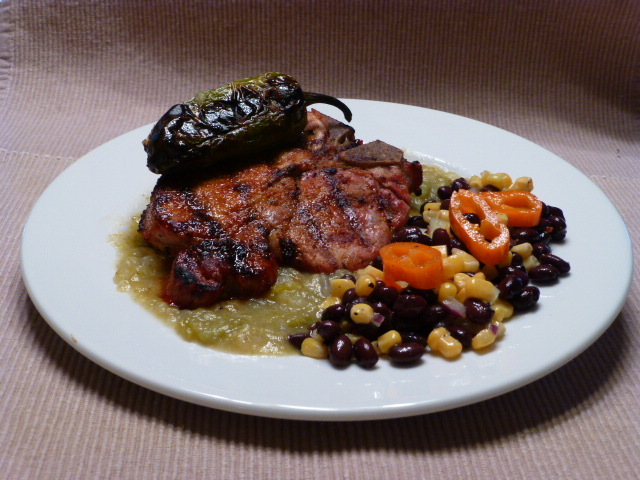 I grilled a pork chop with a dusting of chipotle chili powder and served it on top of the green chile mixture. A grilled jalapeño was there for a little extra kick. On the side, a salad of black beans, celery, onion and miniature sweet peppers provided a cool balance to the chile. This new look for chile verde con carne captured all the great flavors and gave the old recipe a new look. What do with leftovers for breakfast. On March 27, I posted a dinner with a side of asparagus with an egg and Spanish chorizo sausage vinaigrette that was super delicious. Fortunately, I had a little of the sauce and a dozen spears of asparagus left in the fridge. 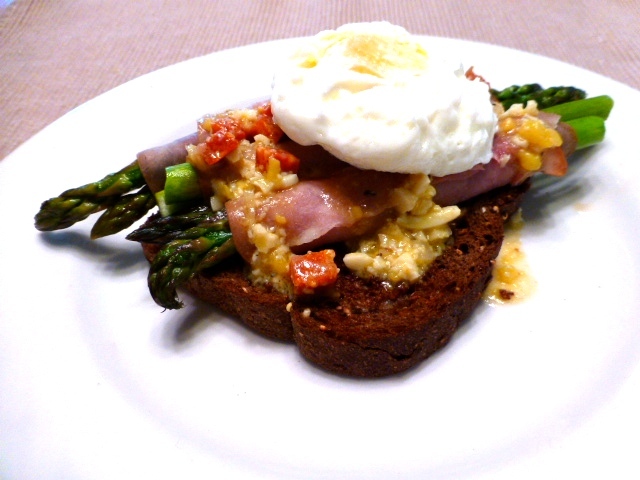 You’ve seen my ham, swiss cheese and asparagus with poached egg breakfast before. This morning, I did a riff on it. I sautéed the asparagus in a dab of butter, wrapped it in deli-sliced (that means tissue paper thin slices you can almost read through) smoked ham and laid them on toasted dark German whole grain wheat bread. The bread is a new discovery for me and it is amazing. It’s made by Pepperidge Farms and not in all the groceries in town. I then drizzled the leftover vinaigrette over it all. I read about a technique for microwave poaching eggs, so I tried it. Break an egg into a custard cup. Add a scant tablespoon of water over the egg. Cover with plastic wrap and poke a little hole in the wrap. Microwave for 1 minute. I like my yolks soft, so I reduced the time to 50 seconds. I still got hard yolks. I’ll do my poached eggs the old fashioned way next time. Even with the hard yolk, the egg on top of the ham and asparagus is always a good touch. 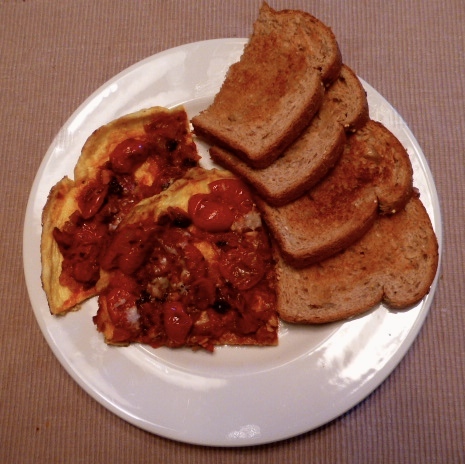 All said, it wasn’t a bad breakfast for using up the leftovers.